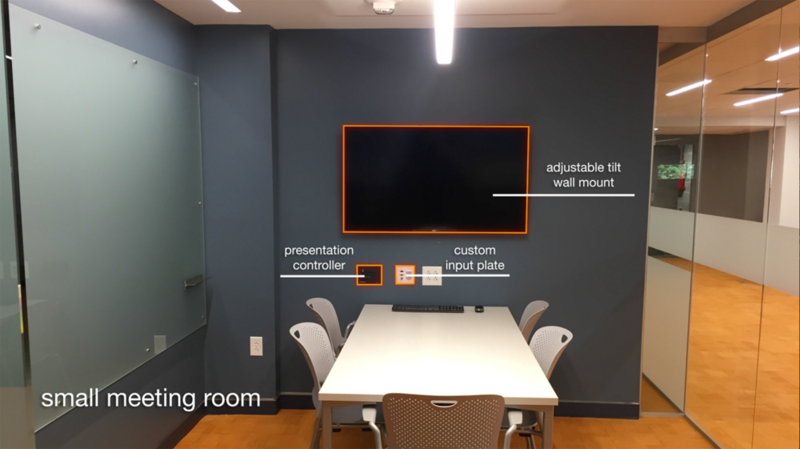 Last year, we had the pleasure of designing an integrated audiovisual system for the new Total Advising Center at the University of Virginia in Charlottesville. The Center was designed as a communal space for faculty and students alike, and is comprised of a large open work area surrounded by many meeting rooms of different sizes. Our challenge was to design and implement audiovisual systems for each size of meeting room, based on their estimated occupancy & function. We fitted each type of meeting room with appropriate display & sound solutions, as well as control panels and custom input plates. We also implemented a large Absen M2 LED wall for the central public area, and supported it with an Analog Way switcher to allow ultimate flexibility in the use of the wall. We also needed a way for these systems to interconnect so that students & faculty could share media between spaces, so we used the 16x16 Crestron DigitalMedia Switcher to distribute the signals from different inputs and allow media to be shared.